Around the time the Great Flood started to recede I was taught to write, “Everyone must remove his shoes.” Funny how boys aren’t bothered by such preferential usage of male gender pronouns. I was well along in my newspaper career when feminists began to point out that our pronoun canon excluded about half of humanity. Almost overnight it became “Everyone must remove his or her shoes.” I did not comply — not for misogynistic reasons, but as a matter of style. There is nothing elegant in his or her and she or he. I could always find an escape hatch, such as “Guests must remove their shoes.” Paramount for me was number harmony along with style. While sensitivity to sexual identity in some instances may be appropriate, it need not encompass everyone; some of us are not reluctant to be categorized. And demolishing the grammatical edifice of number harmony to achieve this seems a bridge too far. As Sam Goldwyn would say, include me out — because, along with reading and ’riting I was also taught ’rithmetic and two plus two will never be five, political correctness notwithstanding. Previous “Wasted Words” post: The Origins of Texting. 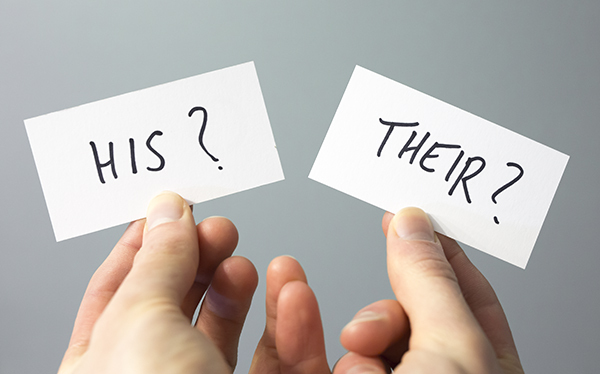 8 Responses to "Wasted Words: Quarrelling With Pronouns"
So, is there a solution to this? Some people take exception to the use of ‘he’ as a term that some insist represents everyone (in the singular, that is). What is an editor to do? This is the first time I have disagreed with you, Wilf. Not a bridge too far. I have used the singular “they” at the request of clients for at least a decade, maybe two. It was hard to accept at first, but since I had been hearing it in speech, including news broadcasts, for a long time, It was not too hard to adjust. Bonus question: Given your love of number equality, Wilf, where do you stand on a comma queen’s use of the royal (or editorial) “we”? I’m with you, Wilf. I think the singular they/their stinks, and I’ll always look for away to work around it. Regarding the royal/editorial we, you’re teasing, Virginia. As you are no doubt aware, the monarch and the editor use “we” not personally, but as the embodiment of a single entity, the realm or the newspaper. That’s my point exactly, Colin. The plural “we” stands for a singular entity. That’s another way of saying the numbers don’t add up in plural uses of the royal “we” any more than in singular uses of “they.” So, perhaps having numbers that add up isn’t the only function of pronouns. Norris concedes this is all in flux. It will be interesting to see where things fall. But since the singular ‘they’ has a roughly 400-year history in English literature, and its use has been argued about for the past century at least, we might have a long wait.